Following the great and the most appraised and admired movement in world history-the French Revolution, it was in the United States that Blackjack found its place and was met with popular appeal. After having instant fame, it was realized that Blackjack was a brilliant game of odds and bets. 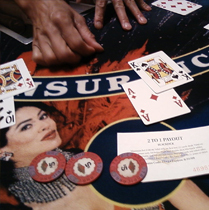 Till the nineteenth century, the government did not intervene significantly and Blackjack developed and gained much popularity along with other gambling games. It was only after that the United States government starting making regulations concerning gambling since it was becoming a hub of crime and corruption. After being officially counted as a crime by law in 1910 by the State of Nevada, decent and genuine players who were not criminals were having a tough time managing through and faced hurdles while playing the game. As a result, people went underground and the game was secretly played, and crime was also furthered. As a consequence of the utter deterioration of the players, it was finally realized that the best would be to legalize the game; which was eventually done, but laws were also framed which would protect the genuine players. It was time for the game of Blackjack to become extremely popular with sudden swiftness, and Las Vegas re-emerged and flourished. The reason why Las Vegas became a center was the fact that other states were still reluctant in legalizing the game; so people started to come to Las Vegas to enjoy the game. Blackjack is now considered as one of the most brilliant casino games of the world, and is played everywhere including the casinos of Europe, Canada, and Russia. Card Counting: A brief historical overview! Roger Baldwin, a mathematician, came out with a strategy in 1956, which is now more commonly called as the Basic Strategy of Blackjack, and was first published in the American Statisitical Association Journal. Card counting developed, and people like Cantey, Maisel and McDermott continued work on the "Basic Strategy", and modern counting was finally developed by Professor Edward Thorp. The whole theory relies on the argument that there is "memory" in the card decks; and that by using certain techniques and methodologies, a player can know a lot about the card decks and make the right next move. There was great deal of activity in this field, and a lot of research followed, but a major work came out in 1962; when Thorp published "Beat the Dealer". A layman who gambles in the casino would find it hard to understand the mathematical theories related to gambling which are given by Thorp, but Thorps work is laudable in the sense that it has significantly contributed in making Blackjack more popular within the gambling community.